The Fog of War (2003) ranks with the great political documentaries of all time. Errol Morris earned an Academy Award for his portrait of Robert McNamara, the regret-ridden former Secretary of Defense regarded as the architect of the Vietnam War. The filmmaker's latest offers a sequel of sorts with its examination of another military mastermind's imprint on history. This time, though, Morris' attempts to penetrate the delusions and defenses of Donald Rumsfeld are hindered less by fog than by a succession of smoke screens. Reviewers have suggested that The Unknown Known, which will screen on March 24 and 28 at the Green Mountain Film Festival in Montpelier, isn't as fine a film as Fog. They note that Morris fails to crack his subject, to make Rumsfeld concede to having second thoughts — in some cases, any thoughts — about the role he played in causing and botching the Iraq War. This critique misses the point. The wholesale absence of honest appraisal, self-awareness or contrition doesn't reflect the picture's shortcomings. It reflects Rumsfeld's. The youngest Secretary of Defense in U.S. history, appointed by Gerald Ford (there's a Chevy Chase joke in there somewhere) and again by the elder Bush, Rumsfeld has been around the Beltway block. Morris fills in any gaps in the popular memory regarding how he scaled the pinnacle of power. Rumsfeld's idea of a ripping yarn is a practically knee-slapping account of the 1975 Sarah Jane Moore assassination attempt, after which he and a Secret Service agent pushed the president into his limo and threw themselves on him. The punch line? "Suddenly I hear a muffled voice: 'Hey, you guys are heavy.'" Suitably, though, the movie begins and finishes with Iraq. On this topic, Rumsfeld proves as frustrating an interview for the audience as for the director. Raising issue after perfectly reasonable issue, Morris is detectably dumbfounded by the deflections, word games and bald-faced denials of reality his questions elicit. The 81-year-old Rumsfeld's eyes twinkle. He grins that Cheshire cat grin. And he lies like a rug. You want to reach through the screen and grab him by the throat. Sorry, it's true. In a typical sequence, Morris suggests the White House wanted the public to believe Saddam Hussein was connected with Al Qaeda and 9/11. Rumsfeld adopts a look of puzzlement. "Oh, I don't think so," he replies, "I don't remember anyone in the Bush administration saying anything like that." Next: a clip of a typical Rumsfeld press conference — equal parts briefing and standup performance — from February 2003. A reporter quotes Hussein's assurance to the U.S. that "Iraq has no WMD ... and no relationship with Al Qaeda." "And Abraham Lincoln was short," the Secretary of Defense says with a chuckle. 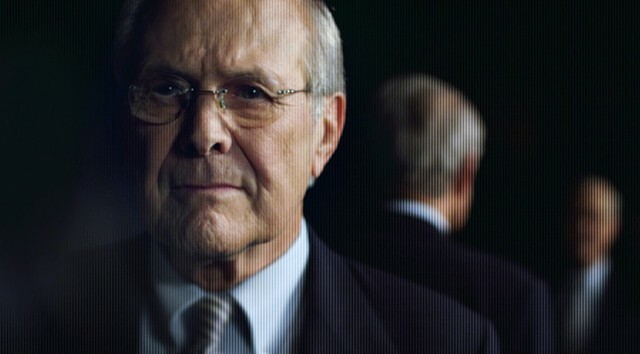 Time after time, Morris backs Rumsfeld into corners. If the legendary director's latest falls short, it's in his hesitation to go for the gotcha moment. Who knows why Morris held back? Maybe he felt Rumsfeld's prevarications and empty rhetoric spoke for themselves. When confronted with the fact that Saddam didn't have WMDs after all, Rumsfeld quips, "The absence of evidence is not the evidence of absence" with that maddening grin. The Unknown Known is both artful cinema and an invaluable historical document. When future generations wonder how we made such a mess of things in the Middle East at the dawn of the 21st century, they'll have only to look on that infuriatingly self-satisfied face and listen to Rumsfeld twisting the truth. It's not a pretty picture, just an immeasurably important one. The Unknown Known is not showing in any theaters in the area.